This post is about a plant which keeps flowering regularly in my garden. White, almost yellow flowers with a blood-red frilly corolla with the stamens jauntily peeking out- yes this is the Bleeding Heart Vine, Bleeding Glory Bower or Bag Flower botanical name Clerodendron thomsoniae (Family Verbenaceae). It can be grown in pots as a bush or climber The medium should have good drainage. 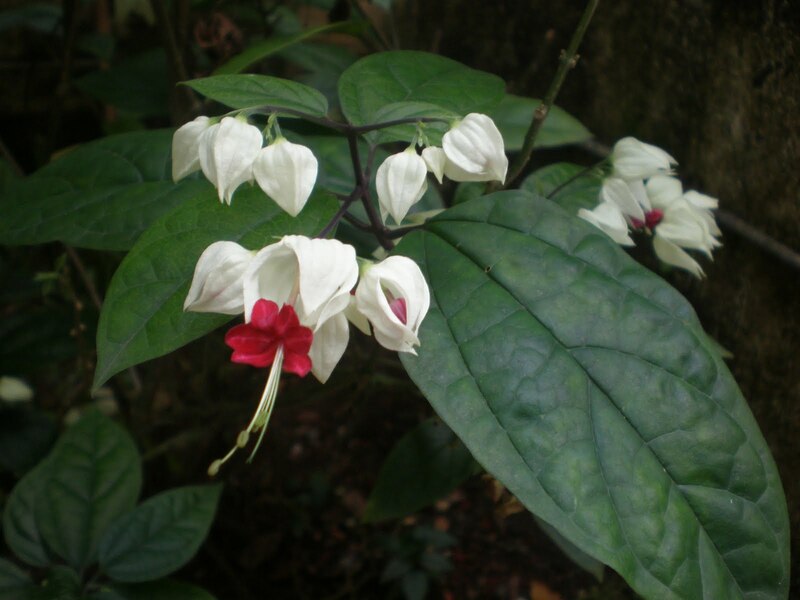 This is one of the rarer flowering plant which can be grown in less sunlight. It gets only an hour's direct sunlight in my garden. It flowers sporadically throughout the year with maximum blooms in summer. The double colored flowers grow in cymes of 8-20, the outer calyx is usually white gives a striking contrast with the red corolla. Add to that the big, dark-green, heavily etched leaves and you have a real show piece. Notice that the buds do not give a hint of the beauty within. After the flowers mature the balloonous calyx turns darker till it is almost purple. At this time one can see a black fruit containing black seeds with an orange lining. I have yet to try growing this plant from seed- action for the next seeds which are formed! I recently found that this plant is a close relative of the glory bower/ wild jasmine (hindi sankuppi) which is grown extensively as a hedge plant in India. I remember seeing this plant very often in my native place. 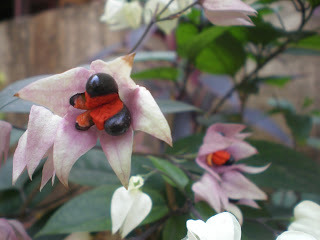 It has white flowers with purple stamens protruding out. Of course the bleeding heart is more showy and does not fail to turn heads when in bloom. Green, white and red all in one plant! Just make sure that you prevent people from plucking the flowers and making your heart bleed! Labels: bleeding heart vine, Clerodendron sp. Beautiful flowers. We don't have them around here. I wonder if they smell as good as they look. No, Anita. Sadly nature does not give its all in one plant, the flower has no smell at all. It attracts lots of butterflies by its color only. Thanks for the detail information. To your surprise your blog was used as a medium of communication with the mali!! BTW the plant is called as 'Moti Vel' in local language. Keep posting your experiments with the greens!! Moti vel is apt; I was searching for its local name.